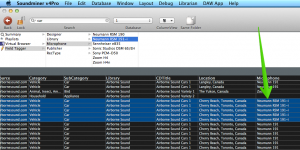 Sound editors and librarians have a lot of choice for managing their sound fx collections. The last article compared 15 metadata and sound browsing apps. There are apps that read a cascade of metadata from a half-dozen formats. Most save metadata changes to a database. A select few write back to the sound effect itself. But how does this metadata get there in the first place? Someone has to enter text info for dozens of fields. 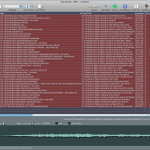 So, while there are many apps that read and write metadata, there are very few that allow sound librarians to compose it quickly and fluidly. Two apps in particular offer a handful of options to get this done. Library Monkey’s Sound Grinder and Soundminer V4 Pro are able to make bulk changes to sound effects library metadata in seconds. 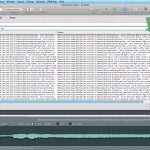 Are you interested in tweaking your sound clip collection’s metadata? Want more info to help you find accurate results quickly? More metadata will help. 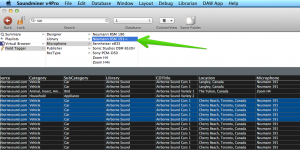 This post explains how to enrich your sound library using one specific metadata app: Soundminer. 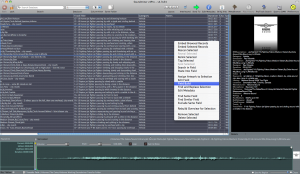 Soundminer is a popular choice for sound librarians and sound editors. One reason is its strong metadata features. It supports ID3 and BWAV metadata. 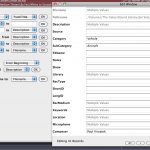 It also has extensive proprietary metadata in dozens of fields, the most of any metadata app on the market today. Composing a distinct, meaningful, and useful description, track title, and notes field is essential for the editors that will use your sound library. Why use distinct metadata? Well, when every sound effect is named the same, they’re hard to tell apart, and they become considerably less useful. 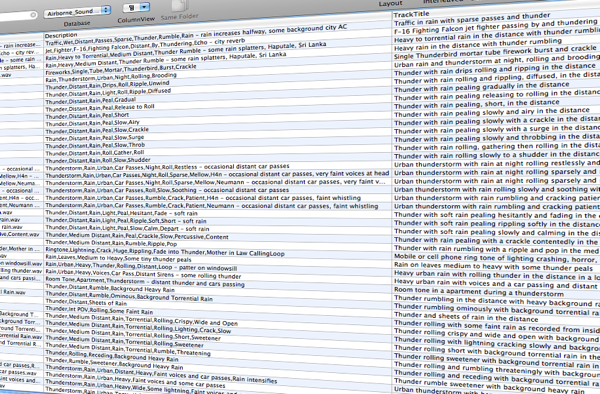 So, the goal when composing metadata is to add unique info for every sound effect in your collection. 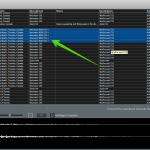 Today’s post will show you tips and tricks to easily speed up the task of adding rich, variable Soundminer metadata to your sound library. We’ll start with the absolute basics, then build upon them with more advanced techniques. Think of this post as a reference sheet. Start with the basics, then refer back to it and weave in new metadata methods when you’re ready. 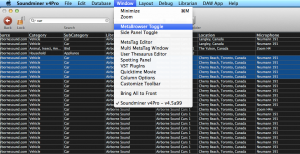 Select one sound in Soundminer’s browsing window. Click the field text you want to modify. After a moment the field will highlight. Click inside the text field. Note: you may click anywhere in empty fields to begin entering text. However, when a field already has info, you must click on the text itself to begin. Shortcut: hover the mouse pointer over the column you want to change and type “command-e”. That will highlight the field. (V4 Pro only). Press the return key, or click off the field to commit the changes. The concept is similar to editing data in iTunes, or changing sound file names in the Finder. Copy the field text by typing “command-c”, or selecting menu item File/Copy. 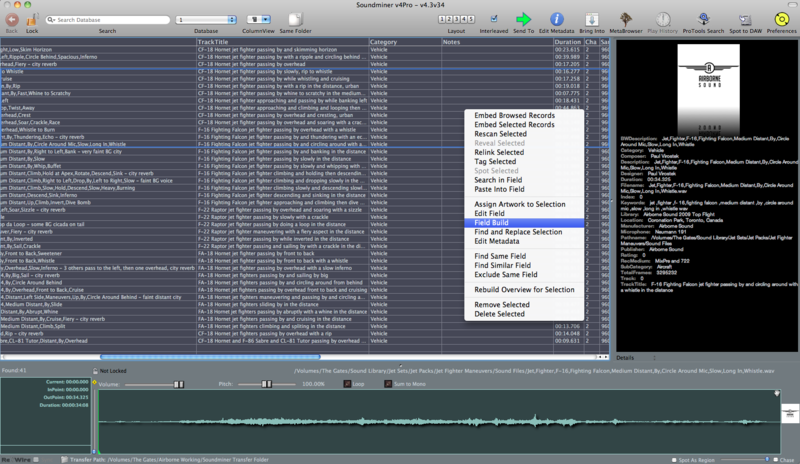 That will paste the text into the new record’s matching field. 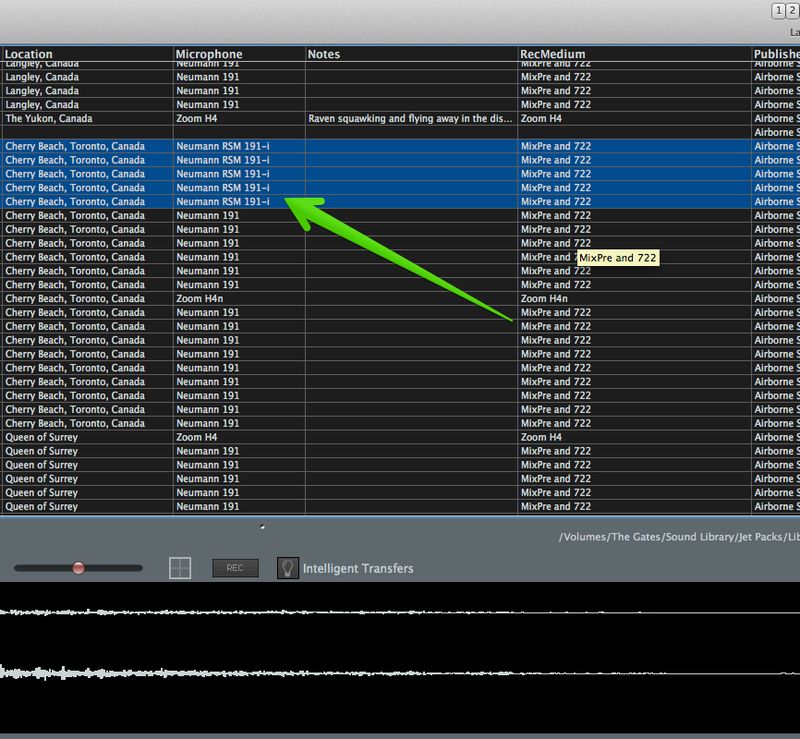 Soundminer intelligently pastes the text in the proper column. 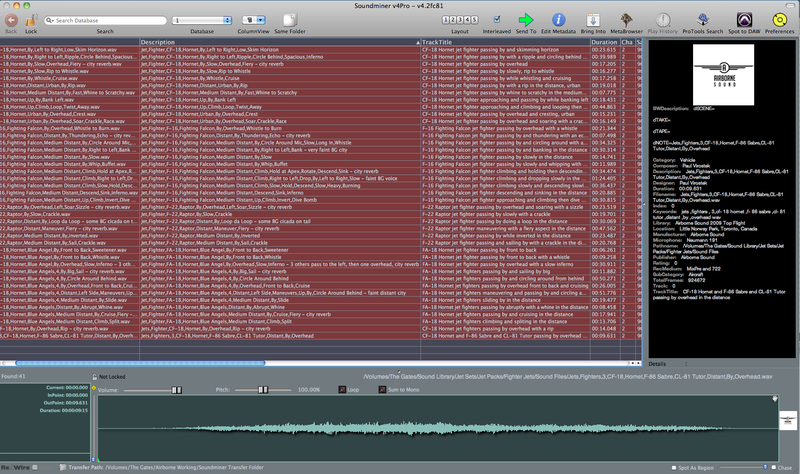 This is particularly handy when pasting text to many records. Simply key down the list rapidly (down arrow key) and repeatedly paste the text. There’s no need to click inside a field to add the text. It’s just pasted without selecting within the field, which speeds things up considerably. Tip: you can use this method to paste text into different fields, too. Simply select the sound row, hover the mouse pointer over the column you’d like to modify, and paste. The text will be added to the field closest to the mouse pointer. 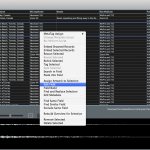 The Find and Replace feature is the first of Soundminer’s batch metadata functions. This is the same function you’ve likely used in word processing software. It’s a bit more stylized, with a few cool features thrown in. Select the files you’d like changed. 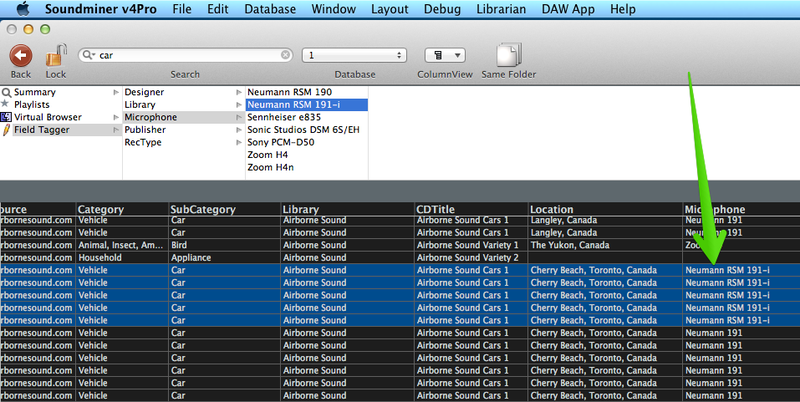 Type command-A to select all browsed sounds. 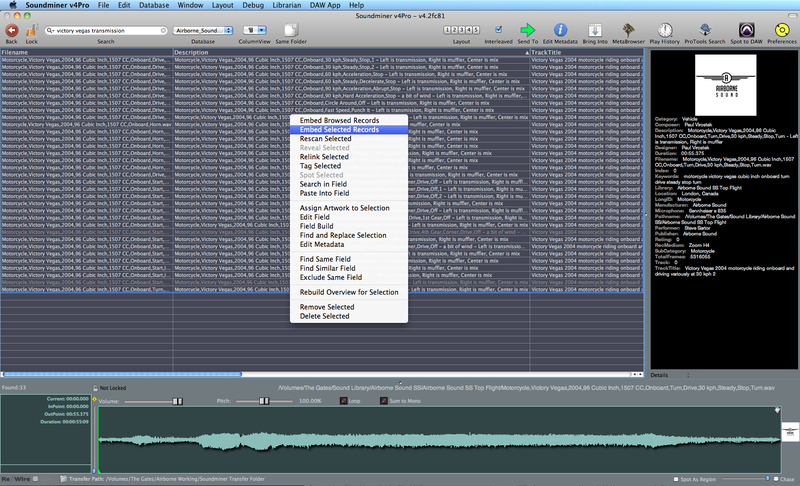 To choose a sequence of sounds instead, click the first in the list, hold shift, then click the last. You can add or remove single sounds by holding command and clicking a sound. Right-click anywhere in the column you want renamed. This can be anywhere in your selection. So, if you’d like to replace something in the Description field, right-click in that vertical column, anywhere in your selection. Select “Find and Replace Selection” from the pop-up menu. A new window will appear. It will display the records you selected from whichever column you right-clicked. Enter the phrase you want to replace in the first field, and the new phrase in the second. Click the Preview button (bottom left) to sample the changes. Click Commit to assign the changes. Tip: you can repeat steps 4 – 6 as many times as you like to apply multiple changes upon your chosen selection of clips. The preview window is helpful to see what your changes will look like before you commit them. Tip: don’t want to type out the text you’d like to change? You can grab text from results list. Simply click on a record in the preview list. The text will become editable. Select the text you want, copy it, and paste it in the “Find” field. Select and copy text to use for find and replace. This is a more sophisticated method available to V4 Pro users. 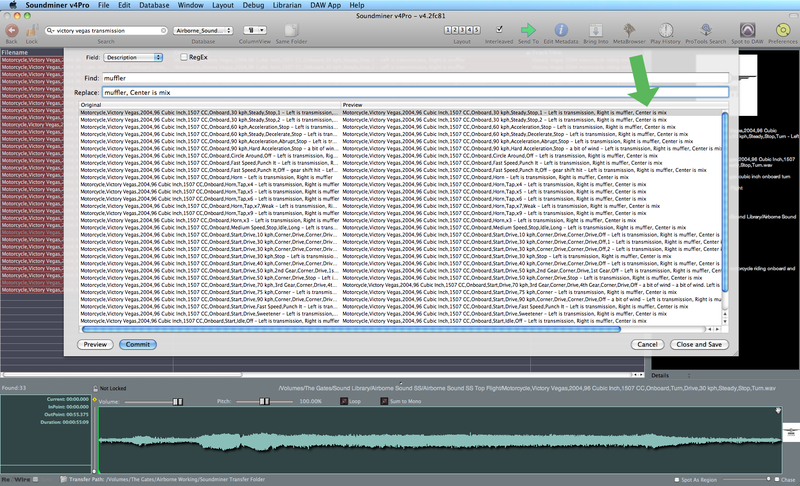 It allows you to apply metadata for a single sound across a number of fields. 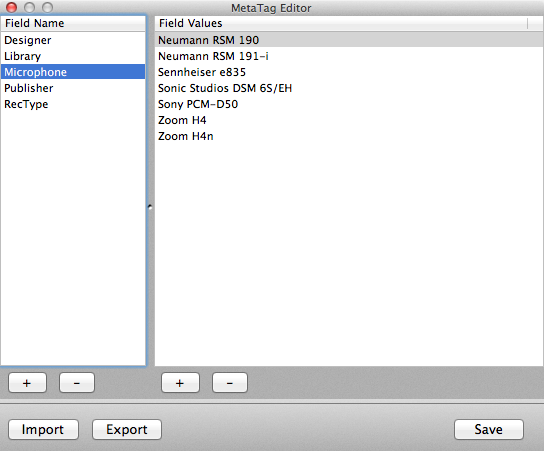 Select the Edit/Edit Metadata menu item (or type command-I, or right-click and select “Edit Metadata”). A window will appear. Fill out whatever data fields you want. Click the Save button to commit the changes. 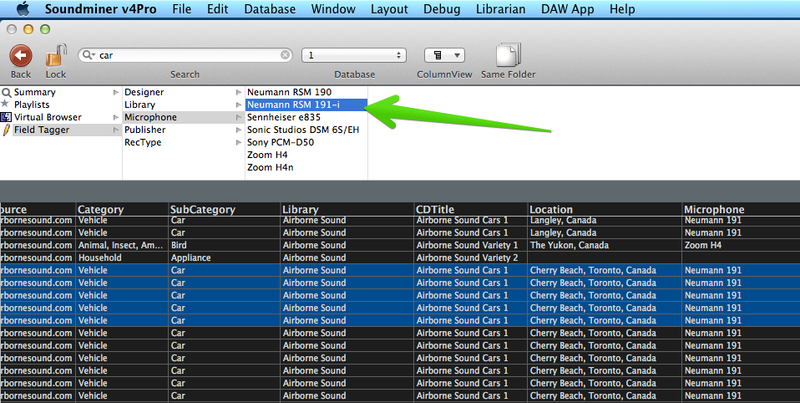 If you’ve selected more than one sound, clicking the arrow button (bottom centre) will display the metadata for the next sound. Update the data, then click your way through the sounds in your list. 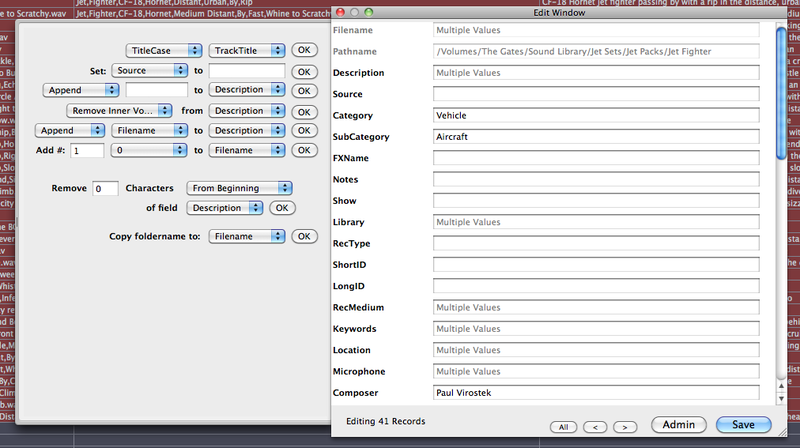 This allows you to add multiple fields of data for a single sound at once. Find and select your tracks, as described in “3. Find and Replace,” above. 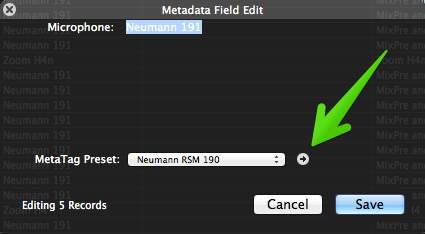 Select the Edit/Edit Metadata menu item (or type command-I or right-click and choose “Edit Metadata”). Choose “Edit Metadata” from the right-click menu. A window will appear. Click the Admin button. A drawer will slide out of the edit window. Transformations: change all text to upper case, title case, or lower case. Set field: assign text in the right box to whatever field is selected from the pull-down menu item on the left. Append/prepend: add text to the beginning or end of any field. Remove specific: strip out vowels, numbers, illegal characters, spaces, etc. Concatenate: combine the text from two fields together. Eg., tack the Category info to the beginning of your Descriptions. Numbers: add numbers to fields using a choice of leading zeros. Remove: strip a set number characters from the beginning or end any field. Copy folder name: finds the name of the folder where the files reside, then dumps it into any field. One cool thing about the admin window it doesn’t commit changes until you click the Save button. That means you can prepend text to one field, add numbers to another, and remove text from the result of those changes. The modifications won’t be applied until you click Save. It’s not easy to see what changes you’ve made, however, so I typically only do one or two changes at a time, save the modifications, then do more. Made mistakes? Not to worry. You can choose the Edit/Undo menu item to reverse all changes (this applies to any metadata naming changes). I use Admin menu to populate most of my data. I find similar files (say, “motorcycles”), select them all, then apply the proper Category and Subcategory to all of them at once. 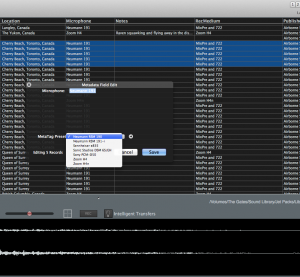 Soundminer’s MetaTag system is a way of creating metadata presets in V4 Pro. 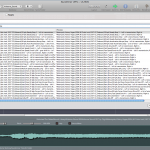 Once these presets are created, they can be swiftly dropped into metadata fields. 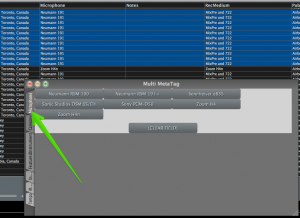 Select menu item Window/MetaTag Editor. A window will appear. 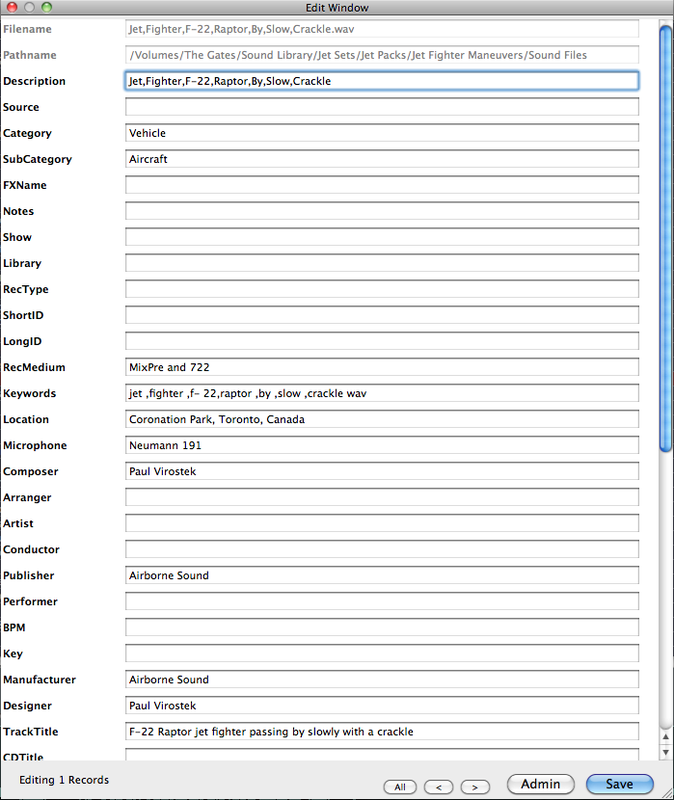 The left pane contains a list of metadata fields. The right contains your presets for that field. Select a field in the left pane. Add a new field by clicking the “+” button. 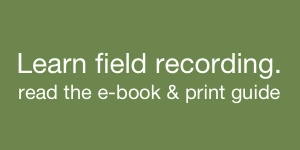 Type the field name. 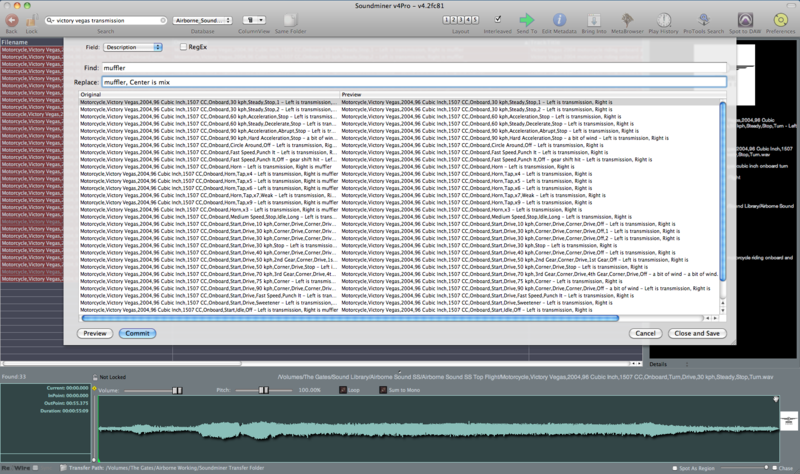 Note that you must match the name of Soundminer’s fields precisely, including capitalization. Click the “+” button under the right pane to add a new preset. That will display a highlighted row. Click inside the highlighted row, and enter your new preset. You can see that I added the microphones I own in the right pane, above. Note: you can paste entire lists into the preset pane. They just need to be separated by a carriage return. Hover the mouse pointer over the column that has metadata you want to change. Right-click. A menu will pop up beneath the pointer. 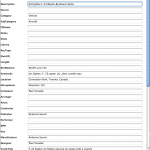 Select “MetaTag Assign”. You’ll see your presets appear in another menu branching off the first. Choose the metadata you’d like to assign. It will be applied to your selections. 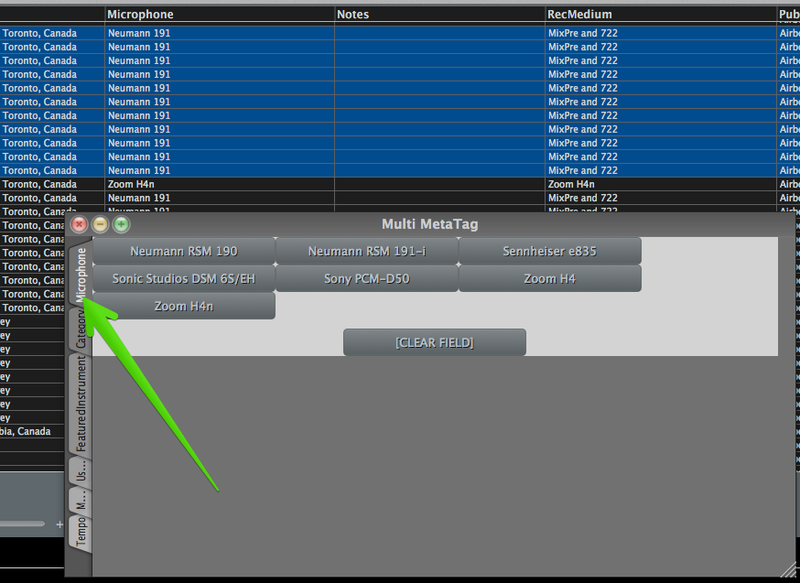 Note: if you haven’t assigned presets for a field, this option will be greyed out. This is similar to the MetaTag Assign method, it just does it in a pop up menu. 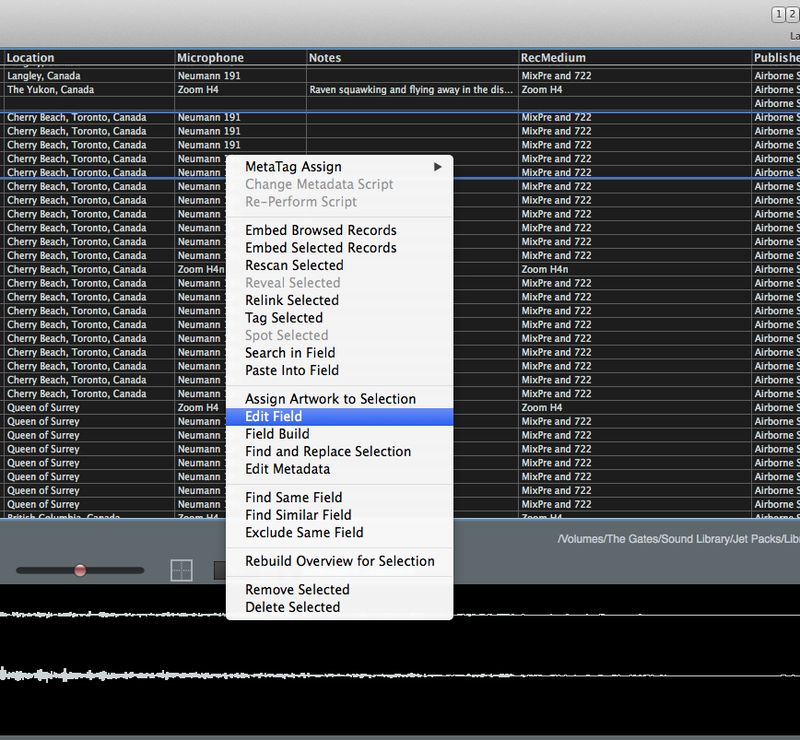 Select and right-click the sound effects you’d like to change using steps 1 – 3 in “MetaTag Assign,” above. Select the menu item “Edit Field”. Select “Edit Field” from the right-click menu. A pop-up window will appear. Select the preset you’d like to apply from the pull-down menu. Select the preset from the drop-down menu. Click the grey arrow to the right of the pull-down menu. The preset will be applied. Click the grey arrow to assign metadata. Click the “Save” button to exit. This option is limited to V4 Pro users. 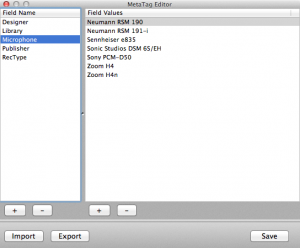 The Field Tagger option is a third way to apply presets. 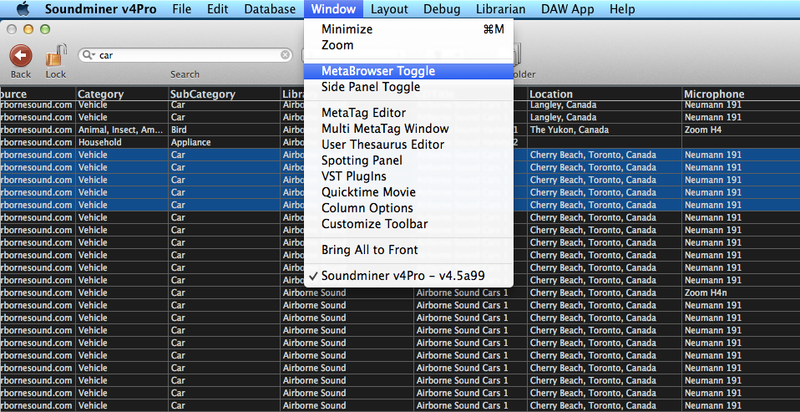 Select and right-click the sound effects you’d like to change using step 1 in “3. Find and Replace,” above. Choose the menu item Window/MetaBrowser Toggle. Select the MetaBrowser Toggle menu item. This will drop down a side-scrolling tree of options. Click Field Tagger. Your available preset fields will appear to the right. Click the field name you’d like to change. Your available presets will appear to the right. Double-click the preset you want. It will apply the preset to all selected records. 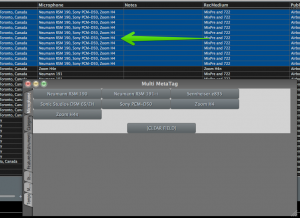 Soundminer’s Multi-MetaTag feature (limited to V4 Pro users) works similar to the MetaTag options. It doesn’t use your defined presets, though. It uses information stored in a hidden preference file (Soundminer/ Package Contents/ Contents/ Resources/ tags.lua). Customizing this hidden file is a bit involved. The Soundminer manual explains how to update it. I’ll show you how it is done with a list I’ve already created. Another difference is that this method is meant to add many pre-defined tags to a single field, each separated by a comma. This was originally designed to add multiple music genres to one field. Find and select your tracks, as described in step 1 of “3. Find and Replace,” above. Choose the menu item Window/Multi MetaTag Window. This will show a window of your tags, each separated in tabs. Note that I’ve selected a “Microphone” tab. That’s not default, FYI, I created it myself. Select a tab from the Mutli-MetaTag window. Click a tag “button.” It will append the tag into the proper field, separating them with a comma and a space. Click as many tags as you like. They’ll all be added, one following another. While this is a bit awkward to set up, it’s a quick way to add a lot of variable metadata. 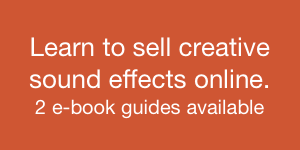 I could see this being especially helpful in the “Keywords” field. 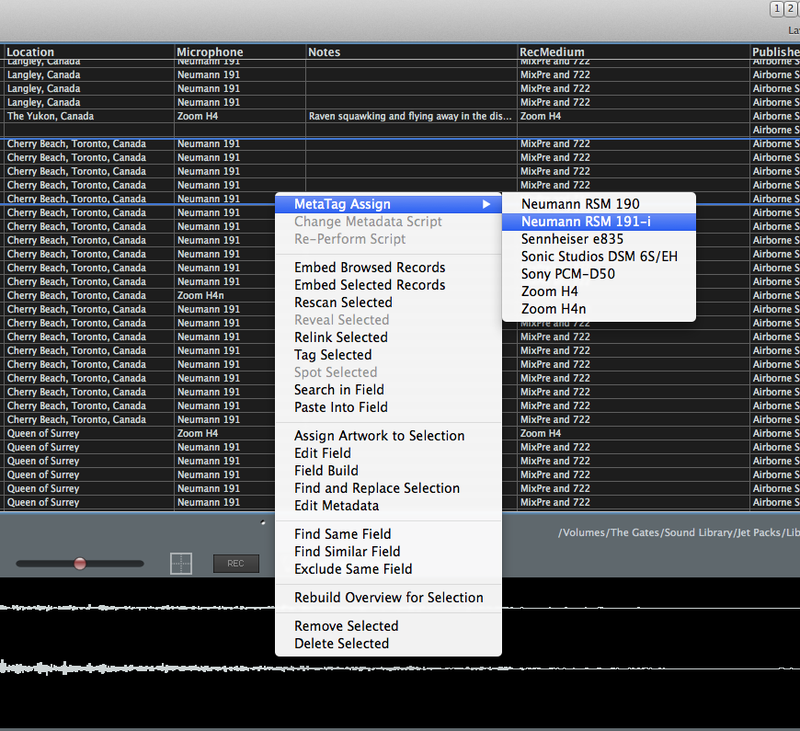 Finally, Soundminer’s Field Build function (V4 Pro only) allows you to combine a number of existing fields, string them together one after another, and dump them into another field. You can also add other random text in there, too. It is similar to Excel’s Concatenate function, and the Concatenate option in the Edit Metadata Admin window we saw above. 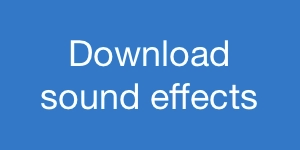 Select and right-click the sound effects you’d like to change using steps 1 – 3 in “6. MetaTag Assign,” above. Select “Field Build” from the right-click menu. A window will appear. Fill out the Scheme field. Add fields by typing the exact field name within < and > characters (e.g., <Description>). Add as many fields and intersperse any other text among them as you prefer. You’ll see the result dynamically update at the bottom of the window. Limit the number of characters in the field using the Length field. You can touch up the destination field using the pull-down if you didn’t right-click the proper one in the first step. Click the “OK” button to apply the change. Note: You can easily undo any of these changes if you make mistakes using menu item Edit/Undo Do this before you embed the changes to the sound files. Don’t forget that all these changes are only applied to Soundminer’s database, not the files themselves. 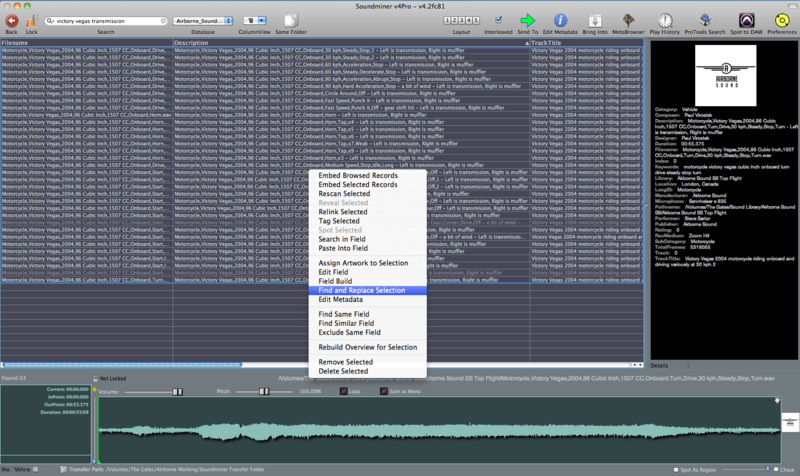 Find, select, and right-click your tracks as described above. 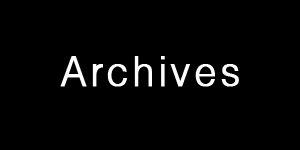 Select Embed Selected Records. This will commit the changes to the sound files. Warning: this cannot be undone. Select “Embed Selected Records” from the right-click menu. 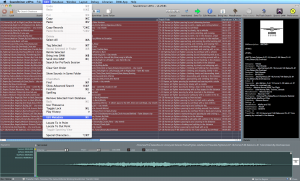 Once you have these 10 tips mastered you’ll be able to sweeten your metadata quickly and accurately. There’s a faster way to do this, though. 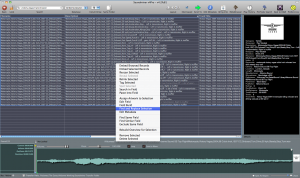 It’s a method meant for power users: using “external text files” and spreadsheets to modify your Soundminer library names. I’ll explain more in the next article.